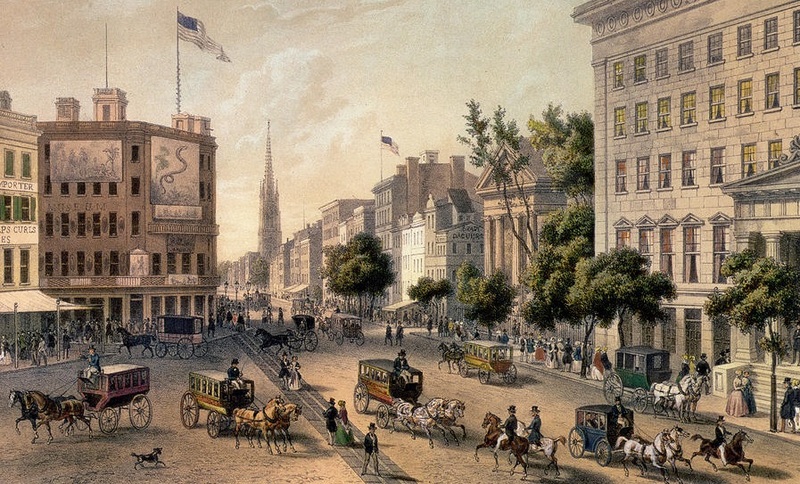 The character in Herman Melville’s “Bartleby, The Scrivener: A Story of Wall Street” (1853) with its arguably inscrutable behavior and open rejection of the conventions of social life in early capitalism has historically baffled critics and readers. I’d like to offer some notes based on the apparent binary opposition between the narrator and the title character. In the characterization of Bartleby as a man of preferences and the narrator as a man of assumptions there is an underlying contrast of the concepts of change and permanence. An assumption is a rational process, thought in fluctuation, and in this sense a sort of movement like the one the narrator is able to perform across the city; an agency apparently not available to Bartleby. Assumptions are furthermore based on presuppositions (social, linguistic): in the context of a lawyer’s office, for instance, the copyist is expected to comply with the boss’ directions. The whole body of the narrator’s actions seems to be grounded on assumptions and presuppositions. He hires Bartleby because he thought “a man of so sedate an aspect” would counterbalance the fiery temperament of his other copyists, he assigns him a place within easy call for the same reason, he assumes his vision is impaired when he decides to stop copying and he thinks he would leave when he asks him to. Naturally, these presuppositions fail to produce the desired effects. Bartleby’s “logic of preference” predicated on the irremissibility of his phrase “I would prefer not to” allows him to avoid any unwanted movement and ultimately stymie his own ability to pursue his own desires. Deleuze declares: “the formula is ravaging, devastating, and leaves nothing standing in its wake”, and we must remember that it is also contagious. The narrator and the other copyists unconsciously begin to use it and it even seems to affect Bartleby’s own actions thwarting his ability to act and move in space. Bartleby apparently cannot cross the threshold separating his desk from the lawyer’s office (“a motionless young man stood upon my office threshold, the door being open for it was summer”; “I heard a slow scrape of his chair legs on the uncarpeted floor, and soon he appeared at the entrance of his hermitage”. ); he continually stands motionless watching the walls: when he gives up copying he is described as another fixture in the room and from this moment on he seems unable to abandon the office. Bartleby’s inertness is of course also related to these so-called “dead-wall reveries”. The reveries are the symbol of the homogeneity of his preferences and they bring about another interesting dichotomy in the story. Unlike Bartleby, the narrator is ostensibly a skilled city dweller. For instance, when he is asked to remove Bartleby from the building he is able to scape running up “Wall-Street towards Broadway, and jumping into the first omnibus”. The walls, in this sense, may function as a defense for Bartleby against the rising urban landscape “which [perhaps] had become more than he could stand”. However when we compare the walls to the suggestion of (natural) “life” Leo Marx argues is present in the green panels of the lawyer’s office and in the grass in the prison’s yard, the walls are no longer a shelter but rather seem to infuse in Bartleby a progressive inertness and set him in an inexorable motion towards death.